We present a step-by-step image guide on How to buy Bitcoin, on GDAX which is a part of Coinbase. Why GDAX? After you get your funds on Coinbase, the % of fees that it puts on each of your purchase and sale would not be a problem if you are trading instead of just holding. If you are buying and selling regularly on Coinbase, this fee could actually be of a concern as it starts cutting your profits or even losses. GDAX (Global Digital Assets Exchange), allows you to trade different pairs according to the country you are trading from. 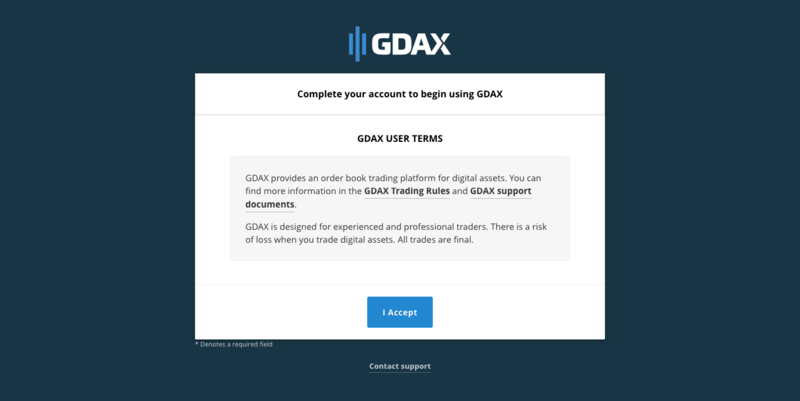 Please follow the below-mentioned steps to understand how to register on to the GDAX exchange to begin trading. Complete the sign-up form, then click “Create an account”. Excellent! You now have an account on GDAX. Click the verification link sent to your email address. You will be directed to the user terms. Click on ‘I Accept’. Nice! Your GDAX account is now activated. After verifying your email address, you will be asked to provide a phone number. You will be given an OTP (One Time Password). 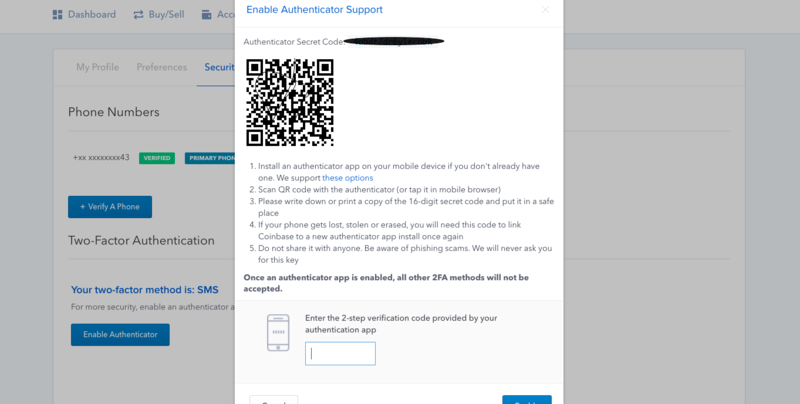 You also have the option of setting up 2-factor-authentication using Google Authenticator or Authy. Enter the code and click on ‘Next’. Specify whether you would like to create an ‘Individual’ or ‘Institutional’account. Depending on the account type selected, you will need to provide information about yourself or your institution. Once you enter the details click on ‘Next’. 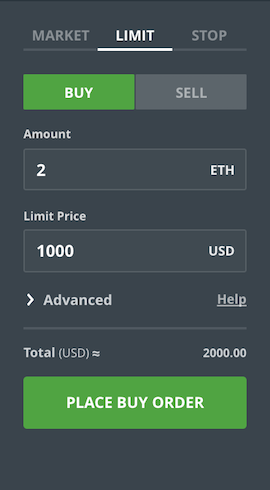 You have the option to link your bank account so you can fund your trading account with USD, GBP, or EUR. 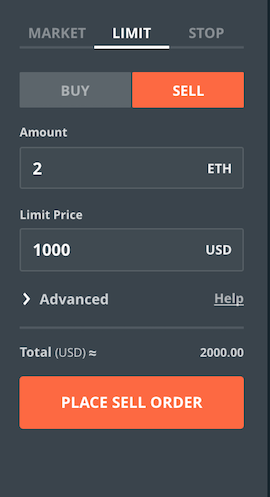 Alternately, you can skip this step and fund your account with BTC or ETH as seen in the below screenshot. Perfect! You have verified your GDAX account. 4. Wondering what 2FA is? Two-factor authentication (also known as 2FA) is a type (subset) of multi-factor authentication. It is a method of confirming a user’s claimed identity by utilizing a combination of two different factors: 1) something they know, 2) something they have, or 3) something they are. An excellent example of two-factor authentication is the withdrawing of money from an ATM; only the correct combination of a bank card (something that the user possesses) and a PIN (personal identification number, something that the user knows) allows the transaction to be carried out. In the case of exchanges what the user knows are the login details username and password and what he possesses is the 2nd factor for the authentication which is a code. The code can be either received through SMS on users personal mobile phone or found in an application like Google Authenticator or Authy. 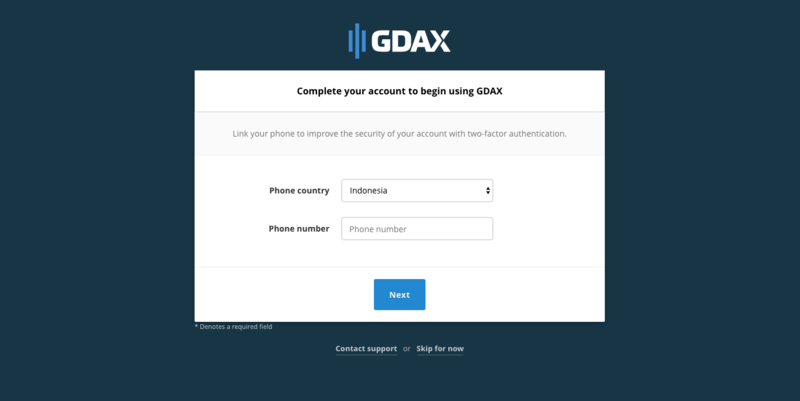 So, from your homepage, https://www.gdax.com/trade click on your account, settings from where you can set the 2FA up. Click on the Two-factor-authentication tab. 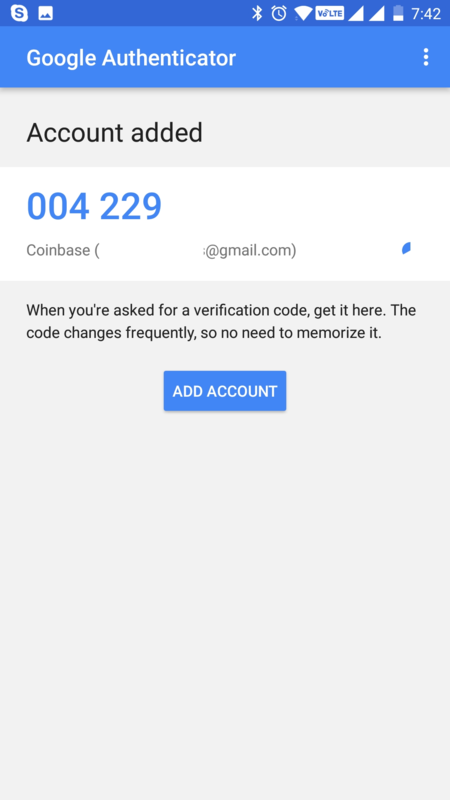 Either manually enter the key in the Google Authenticator app or scan the QR code. Either way, please write down for Safekeeping the OTP ( one time password for Google Authenticator ) so that in the event you need to reset it you have this ( please note that in the image it is blurred for safety reasons. Please consider this as a master key. Without it, you cannot reset in case it whoever. Once you do this scan or manual input a single time, a one time password will be generated, that you need to write/copy in the One-time password empty field. Now you should be good to go so whenever you log in to your account or perform any other operations you just open the Google Authenticator app and insert the one time password given shown there. It shows Coinbase as GDAX is a part of Coinbase and you can always ‘Sign In’ using your Coinbase account. More details on how to use Google Authenticator here. Nice work! You have activated Google Authenticator on your GDAX account. You can now proceed to fund your GDAX account from your bank account. 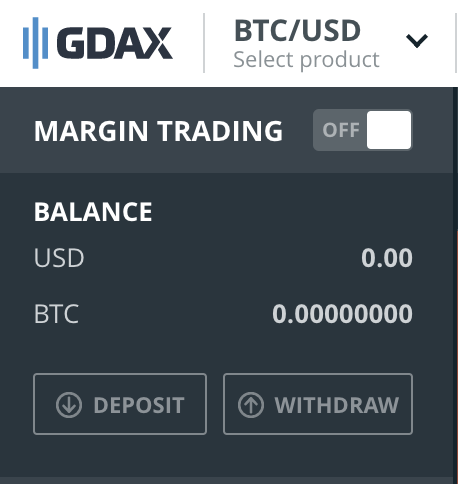 These buttons on left side of the GDAX exchange will help you with transferring FIAT or digital currencies between Coinbase and GDAX. 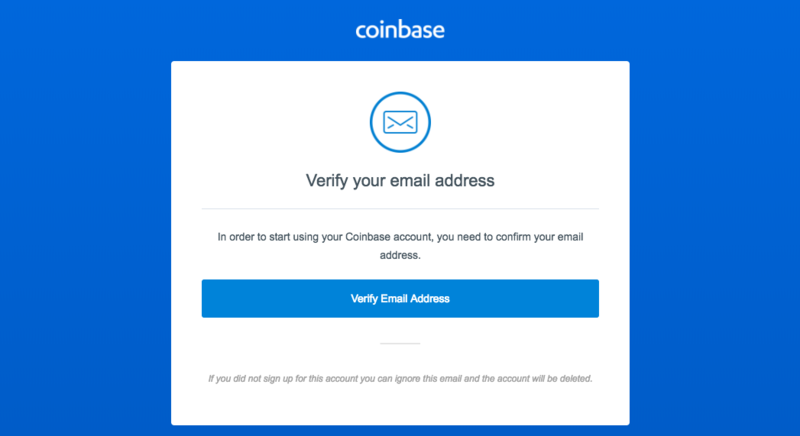 You can use the funds which you’ve deposited into your Coinbase account. You can deposit form the Bank account linked to your Coinbase account. Read carefully the details so that you are sure you follow the correct path for deposits. Great! You have funded your GDAX account. Below you will see the order book. This section shows how many orders are present for each price point. Red ones show the sell orders for different price points. 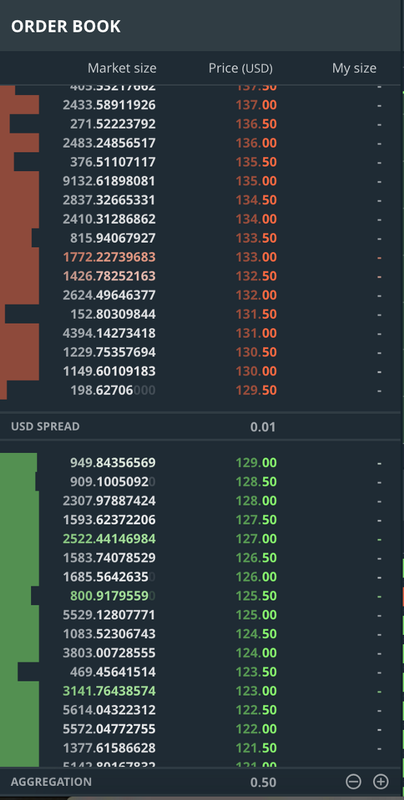 Green ones show the buy orders for different prices. Price Chart gives you the option to select intervals like 1m, 5m, 15m, 1hr, 6hr, and 1day. This helps you study the movement of the selected trading pair over time. Depth Chart shows you the supply and demand of selected trading digital currency against the trading currency. Below these charts will you find two tabs for orders and fills. When you place an order, it shows up here and time elapsed since you’ve placed that order. Once the price reaches the price you’ve place — it gets executed, which means you will be allocated the amount of digital currency according to the order placed. This is called order being filled, then it moves to the filled tab. What are Makers and Takers on GDAX? Maker Order means you make an offer and someone accepts it. That makes you the maker and the recipient the taker. Taker Order is if you accept the offer (buy/sell) someone has made to you. That makes you the Taker and the sender the Maker. Mastering Limit buys and Sells. Now that we know what’s a Maker and Taker orders are and that different exchanges will have different fee structures for them. GDAX is a kind exchange where fees for all Maker orders is absolutely ZERO (as of January 22nd 2018). So if we can place Maker orders properly while buying and selling — then there won’t be any transaction fees! Hurray! Here’s how to place a Limit Buy and Limit Sell, so that you will always be making an offer and your order will be charged 0 transaction fees. Limit Buy is placing an order with conditions. Here you can specify the quantity and at what price point, it should execute. In this case, you are making an offer and it gets executed only when someone takes it. Limit Sell is an order where you specify the quantity and price at which your order gets executed. Order is the condition you put along with the quantity. Execution means, the order being fulfilled. Once the order is closed, you have just bought your first coin! Congratulations! You bought your first Bitcoin on GDAX. Transferring Bitcoin from GDAX (CoinBase Pro) to other exchanges. How to transfer Bitcoin from GDAX (CoinBase Pro) to Bits Blockchain? How to transfer Bitcoin from GDAX (CoinBase Pro) to BCEX? How to transfer Bitcoin from GDAX (CoinBase Pro) to B2BX? How to transfer Bitcoin from GDAX (CoinBase Pro) to Upbit? How to transfer Bitcoin from GDAX (CoinBase Pro) to Coinfloor? How to transfer Bitcoin from GDAX (CoinBase Pro) to QuadrigaCX? How to transfer Bitcoin from GDAX (CoinBase Pro) to HADAX? How to transfer Bitcoin from GDAX (CoinBase Pro) to OEX? How to transfer Bitcoin from GDAX (CoinBase Pro) to LBank? How to transfer Bitcoin from GDAX (CoinBase Pro) to Fisco? How to transfer Bitcoin from GDAX (CoinBase Pro) to Qryptos? How to transfer Bitcoin from GDAX (CoinBase Pro) to Coinone? How to transfer Bitcoin from GDAX (CoinBase Pro) to BTCBOX? How to transfer Bitcoin from GDAX (CoinBase Pro) to OOOBTC? How to transfer Bitcoin from GDAX (CoinBase Pro) to CoinTiger? How to transfer Bitcoin from GDAX (CoinBase Pro) to Bitstamp? How to transfer Bitcoin from GDAX (CoinBase Pro) to Dragonex? How to transfer Bitcoin from GDAX (CoinBase Pro) to RightBTC? How to transfer Bitcoin from GDAX (CoinBase Pro) to GetBTC (FIAT to BTC)? How to transfer Bitcoin from GDAX (CoinBase Pro) to EXX? How to transfer Bitcoin from GDAX (CoinBase Pro) to gate.io? How to transfer Bitcoin from GDAX (CoinBase Pro) to Exrates? How to transfer Bitcoin from GDAX (CoinBase Pro) to CoinsBank? How to transfer Bitcoin from GDAX (CoinBase Pro) to bitFlyer? How to transfer Bitcoin from GDAX (CoinBase Pro) to Kraken? How to transfer Bitcoin from GDAX (CoinBase Pro) to Coinbase? How to transfer Bitcoin from GDAX (CoinBase Pro) to Gemini? How to transfer Bitcoin from GDAX (CoinBase Pro) to Indacoin? How to transfer Bitcoin from GDAX (CoinBase Pro) to 1BTCXE? How to transfer Bitcoin from GDAX (CoinBase Pro) to Bitbank? How to transfer Bitcoin from GDAX (CoinBase Pro) to Allcoin? How to transfer Bitcoin from GDAX (CoinBase Pro) to DigiFinex? How to transfer Bitcoin from GDAX (CoinBase Pro) to CEX.io? 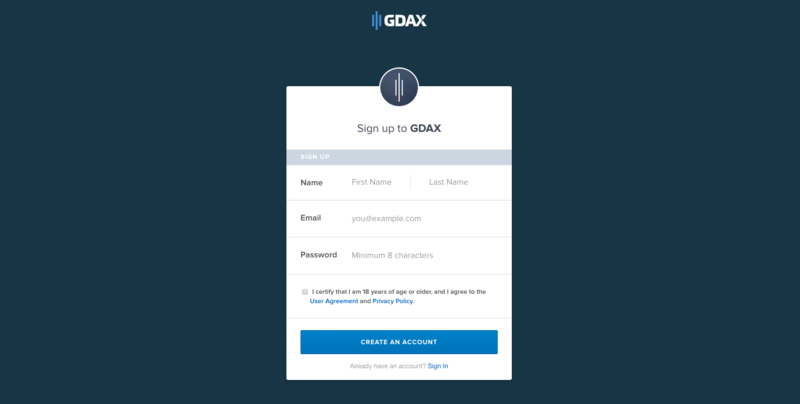 How to transfer Bitcoin from GDAX (CoinBase Pro) to Idax? How to transfer Bitcoin from GDAX (CoinBase Pro) to BitForex? How to transfer Bitcoin from GDAX (CoinBase Pro) to OKEx? How to transfer Bitcoin from GDAX (CoinBase Pro) to Bibox? How to transfer Bitcoin from GDAX (CoinBase Pro) to KuCoin? How to transfer Bitcoin from GDAX (CoinBase Pro) to HitBTC? How to transfer Bitcoin from GDAX (CoinBase Pro) to Poloniex? How to transfer Bitcoin from GDAX (CoinBase Pro) to CoinEx? How to transfer Bitcoin from GDAX (CoinBase Pro) to TOPBTC? How to transfer Bitcoin from GDAX (CoinBase Pro) to Coinbene? How to transfer Bitcoin from GDAX (CoinBase Pro) to Coinegg? How to transfer Bitcoin from GDAX (CoinBase Pro) to Bitlish? How to transfer Bitcoin from Gdax (CoinBase Pro) to Coinsuper? How to transfer Bitcoin from Gdax (CoinBase Pro) to xBTCe? How to transfer Bitcoin from Gdax (CoinBase Pro) to CoinFlux? How to transfer Bitcoin from Gdax (CoinBase Pro) to Bittrex? How to transfer Bitcoin from Gdax (CoinBase Pro) to Binance? How to transfer Bitcoin from Gdax (CoinBase Pro) to YoBit? How to transfer Bitcoin from Gdax (CoinBase Pro) to WEX? How to transfer Bitcoin from Gdax (CoinBase Pro) to SouthXchange? How to transfer Bitcoin from Gdax (CoinBase Pro) to OKCoin? How to transfer Bitcoin from Gdax (CoinBase Pro) to MixCoins? How to transfer Bitcoin from Gdax (CoinBase Pro) to itBit? How to transfer Bitcoin from Gdax (CoinBase Pro) to BTC-Alpha? How to transfer Bitcoin from Gdax (CoinBase Pro) to Bithumb? How to transfer Bitcoin from Gdax (CoinBase Pro) to BitBay? How to transfer Bitcoin from Gdax (CoinBase Pro) to Lykke? How to transfer Bitcoin from Gdax (CoinBase Pro) to Independent Reserve? How to transfer Bitcoin from Gdax (CoinBase Pro) to EXMO? How to transfer Bitcoin from Gdax (CoinBase Pro) to DSX? How to transfer Bitcoin from Gdax (CoinBase Pro) to LiveCoin? How to transfer Bitcoin from Gdax (CoinBase Pro) to LakeBTC? How to transfer Bitcoin from Gdax (CoinBase Pro) to BitInka? How to transfer Bitcoin from Gdax (CoinBase Pro) to Bitfinex? How to transfer Bitcoin from Gdax (CoinBase Pro) to ANXPRO? How to transfer Bitcoin from Gdax (CoinBase Pro) to Gatecoin? How to transfer Bitcoin from Gdax (CoinBase Pro) to Simex? Transferring Bitcoin from GDAX (CoinBase Pro) to wallets. How to buy Bitcoin on BitForex? How to buy Bitcoin on SouthXchange? How to buy Bitcoin on Coinbase? How to buy Bitcoin on Idax? How to buy Bitcoin on Coinbene?